Somebody tells you they've got a new singer-songwriter for you to check out, you're likely to think "coffee house" for the venue. 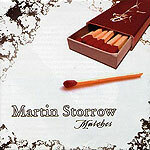 San Diego's Martin Storrow, however, plays a music that would fit more comfortably in a supper club or steakhouse. Closer in spirit to Billy Joel, Bruce Hornsby or A.J. Croce than to Jason Mraz or James Taylor, Storrow's new album (half of which was produced by Del Mar's Peter Sprague, with the other half helmed by Poway's Dan Diaz) is full of sophisticated pop songs anchored by his rich midrange voice. Like Joel and Hornsby, Storrow's songs (he wrote all 11 here) draw as much on classic American pop as they do the school of Bob Dylan. As a singer, too, he's as influenced by Tony Bennett as he is the coffee house crowd. His songs have enough depth and unexpected twists to lend themselves well to the full band and rich arrangements on most of the tracks. Surrounded by local jazz heavyweights like Gunnar Biggs (bass), Duncan Moore (drums) and Barnaby Finch (piano) on half the songs, and rock instrumentation on the other half, Storrow's singing seems absolutely at home fronting these two lineups. The songs are as attractive as they are interesting, the only downside being that there doesn't seem to be a sure-fire hit among them. He's not your typical singer-songwriter, to be sure  but Storrow's new album is one of the more intriguing on the local scene so far in 2007 and worth a listen.